We interviewed nutrition expert and Registered Dietitian Rosanne Rust about her approach to feeding her kids and weight management. Here is what we learned. What do you think are the top 3 important things to think of when feeding your kids? As a mom and dietitian, I feel the most important thing to consider is modeling good behavior yourself. I enjoy a variety of food so my children see me eating everything from low fat granola, to cheese, to whole grain toast, to sandwiches, to eggplant, to ice cream, to apples, to candy bars, to salads, to potato chips, to soups and to beans. This gives them a clear message that you can incorporate a variety of food into the diet, and that you should try new foods, and enjoy what you eat. Secondly, I believe that portions are important. Teaching children appropriate portions from a young age can simply begin by serving them small portions based on their age. Instead of piling food onto plates and sending a “clean your plate” message, parents should offer small portions then allow the child to ask for more if desired. Not sure what the proper portion sizes are for kids? Learn about it here! Finally, I feel that children need to be exposed to a variety of foods, especially fruits and vegetables. 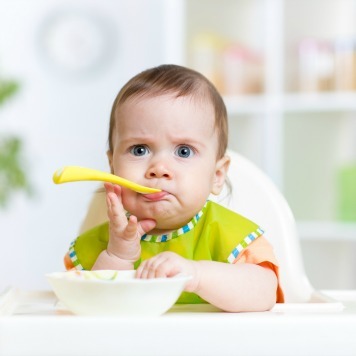 We know that it takes numerous exposures for children to try new foods, so the more often they see them on the table or in the fruit bowl on the counter (and the more often they see their parents eating them! ), the more likely they will someday try and enjoy them! What’s your family’s favorite indulgence with a healthy twist? Lasagna, manicotti, or fettuccini Alfredo. By using low fat or part skim cheeses for the lasagna or manicotti, I can make a delicious dish that is lower in fat and healthier for my family. We have a family history of high cholesterol so I make sure to choose heart healthy fats. I never add meat to my lasagna either. I also make a delicious cream or Alfredo sauce using fat free cream and a few tablespoons of light cream cheese to thicken it. What do bring when it’s your turn to be soccer mom? Who started this trend anyway? I could argue that the kids really do not need a snack after an hour of soccer. Still parents are generally required to bring a snack for the team, so I bring frozen yogurt tubes, low fat granola bars or sandwich crackers (like the peanut butter or cheese type). I have also brought baked chips (one bag per child). I’ll also offer bottled water or a small sports drink. I am not opposed to small pouches of “sugar water” (i.e., “fruit drink”) once in a while since children need the fluid and calories after playing for an hour in the hot sun. But I wouldn’t want this to be their choice at each week’s practice and I’d rather bring 100% fruit juice to provide additional disease fighting nutrients that aren’t found in sugary drinks. Portions are important and the pouch type drinks provide about 7 ounces, which is reasonable. Here are 50 Healthy Snack Ideas your kids will love. What’s your best-kept secret to managing your weight? Exercise! I am not a fanatic, but I do maintain an exercise program all year. I like to do different things so I don’t get bored and stay challenged and interested. I also enlist my friends. I am much more committed to exercise when I meet a friend, and it is more fun to socialize while you exercise! I consistently run 3-5 miles 2-3 times a week, and lift weights twice a week; then I mix in walking, hiking, yoga practice, fitting some tennis in during the spring and summer, cycling (20-30 mile rides), and skiing and snowboarding in the winter. My next venture: kayaking! I also never deprive myself of whatever it is I want to eat (and sometimes that may be corn curls!). I practice what I preach: move your body and eat a variety of foods in moderation. Rust is a licensed registered dietitian who has a private practice in Northwest Pennsylvania. Rosanne is involved locally in the “From Wheels to Wellness Program” that seeks to empower Pennsylvania Girl Scouts to learn how important fitness is to health, and how cycling can become a lifelong path to fitness. She is a nutrition instructor for Penn State’s World Campus and a licensed provider for Real Living Nutrition Services®. www.rosannerust.com. For more information regarding the other nutrition services she offers contact her at Rosanne@rustnutrition.com. 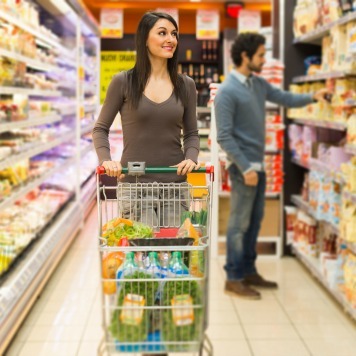 Is Your Grocery Cart Holding You Back?